If you would like some shoulder and hip releases you can do with your bolster, then this video is for you. I have two resources that I want to share with you today. 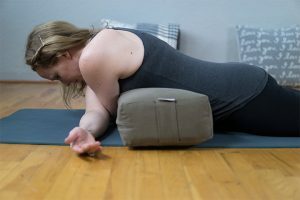 One is a full length restorative yoga class, a 70 min video that I did in June of 2016 on when to use a round yoga bolster and when to use a rectangle bolster. The other is a 40 min Restorative Yoga for Anxiety Class in our membership community that uses a yoga bolster as well. The first pose I have for you is a yin yoga pose that is quite intense without a prop, but with a bolster, it is much more doable, it is called Bowtie Pose. How to Do It: Lie on your stomach. Place the rectangle bolster underneath your low ribs. Cross your arms with your right arm in front of your left arm, reach your arms away. The backs of your arms and hands will be on the ground. You will rest on the bolster and your chin will rest on your arms, or your forehead can rest on the ground or on a block. With yin yoga we come into the pose, we find an appropriate edge and we allow time and gravity to do all the work so that we can get into the deeper tissues. Hold this pose for 3-5 minutes, lie on your back to feel the rebound and then repeat on the other side by switching so that your left arm is in front. This yin yoga pose with the bolster releases your shoulders and your upper back. Specifically it releases your deltoids in your shoulders. When the deltoids are tight, this can alter your posture, so this pose will help to improve your posture. This yoga pose will increase the flexibility of your shoulders and improve your range of motion. Shoulder pain and tension can cause stress and fatigue. This pose will help to relieve the stress and fatigue caused by shoulder tension. When it comes to the upper back this yin yoga pose specifically releases the rhomboids. Weakness and tightness in the rhomboid muscles can cause not only poor posture but also pain in our upper backs. This yoga pose helps to relieve the tension and pain in your upper back. The second pose I want to show you with the yoga bolster is a chest opener. When your chest muscles are tight, your shoulders pull inward and you experience poor posture. Your chest muscles are always working. Whenever you do things with your arms in front of you, it is your chest muscles that are doing all the work. Your chest muscles roll forward, grab, pull, push and hold things tight. Your chest muscles continually roll you forward into a rounded posture. So, if you experience upper back tightness, then releasing your chest muscles is key to relieving upper back pain. How to Do It: For this pose you are going place your bolster horizontally across your yoga mat in the same position as you did for bowtie pose and put your block on the highest setting to support your head. You will lie back over your bolster with the block under your head and your arms out in a soft T. The bolster is under your chest. Improves Posture: Your chest muscles keep your closed, so this restorative yoga pose with the bolster opens up those constantly closed muscles that create poor posture. Relieves Upper Back pain: If you have upper back pain and tension, this pose gets at the root cause, by releasing your chest muscles. Improves Your Breathing: This restorative yoga pose with a bolster will allow you to take more oxygen into your lungs. Improved breathing will increase your energy, improve clarity, focus and concentration and allow you to feel less stress and anxiety, and more calm. The last one is probably my favourite. This pose will release your psoas. A tight psoas can cause major postural problems and is a common cause of low back pain and stiffness. A tight psoas is also known to contribute to arthritis in your lumbar spine. It is super simple. How to Do it: Lie on your back with your knees bent and your feet flat on the floor. Press into your feet and lift your hips off the ground. Place the bolster horizontally under your hips. Lengthen your legs out long and take your arms overhead. Breath deep into your lower belly. Relieves back pain and stiffness. The psoas contracts whenever we go into fight-flight or freeze mode. Releasing your psoas will help to reduce stress and anxiety. Allows you to walk more fluidly and with more ease. If you made it all the way to the end of the video put, “I love my yoga bolster” in the comments.